"I have something stuck between my teeth, how do I get it out?" 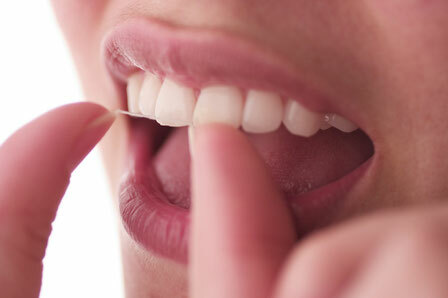 Getting something stuck between your teeth can become very uncomfortable, even painful. Here are a few tricks on how to get your teeth and gums back to normal in that area. Try floss, you probably already tried that. You need to try the "yarny" kind of floss. It will grab the stuck object better. If the yarny stuff shreds go back to regular floss, then get in to your dentist so the "shredder" can be fixed. Next tie a knot or two in the floss and then pull the knot through your teeth from the inside out. As the knot passes through it will catch the object and dislodge it. If that doesn't work try wedging a tooth pick in between your teeth for a few minutes. Then push the toothpick in further for a few more minutes. Then try the floss with a big knot trick a few times. A tooth pick can dislodge the food/object if used properly. If used improperly it can irritate the area and make it more sensitive. You need to put the tooth pick deep toward the root, then lever the tip of the tooth pick out of the pocket. Like a mini pry-bar. Brushing listerine into the area with a toothbrush will help relieve the infection in the gums. Whatever happens you need to get the object out. If you can't get it out you need to call a dentist (contact us).